It's nearly impossible to visit a farmers market this time of year without a head of romanesco, nestled between its broccoli and cauliflower cousins, catching your eye. Was it the pinwheel of stegosaurus-like spiral spikes that first gave you pause? Or maybe its fluorescent lime hue was cause for reconsideration. Either way, we can agree that the romanesco is definitely the most bizarre-looking Brassica of the bunch. But if that fractal eccentricity means you're habitually turning to its tamer family members, I urge you to try those crazy spikes in the kitchen with Pan-Roasted Romanesco with Golden Raisins, Tahini & Sumac. Contrary to its sharp exterior, romanesco has a very mild flavor; significantly subdued compared to broccoli or cauliflower. That's not to say the romanesco is dull—I've often seen it described as having a "sweet nuttiness" that becomes accentuated with high-heat cooking. Think of it as a vegetable to be praised for its agreeableness, perhaps; boasting a wonderfully crunchy texture primed for charring in that deeply satisfying way exclusive to roasted winter vegetables. 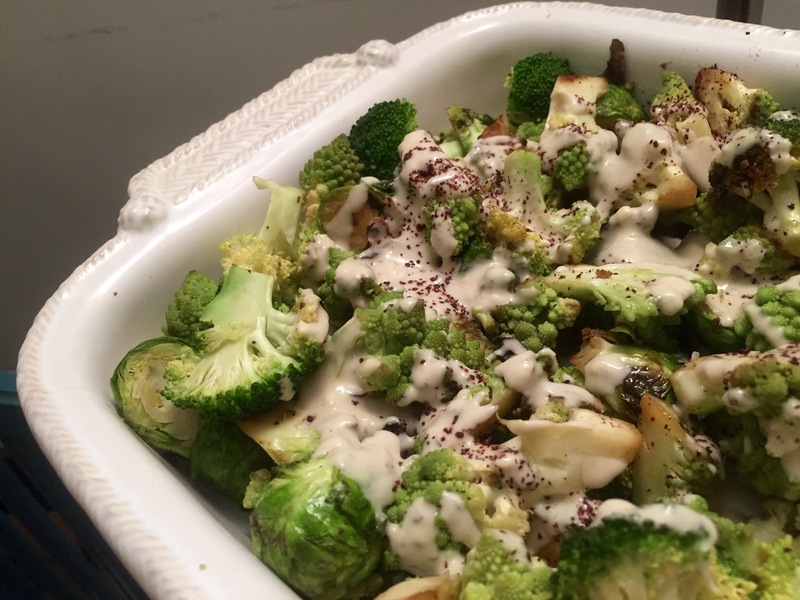 And yet, an oven isn't even required to cook the romanesco to perfection in this recipe. Instead, the florets are pan-roasted, achieving beautifully bronzed, charred edges in just 10 minutes time. At first, I was skeptical: how could such a burly stalk be cooked to completion via open stove top with minimal oil so quickly? The secret, it turned out, was in the finish. After approximately 8 minutes of charring, the florets are "steamed" with a splash of vegetable broth for the remaining cook time. 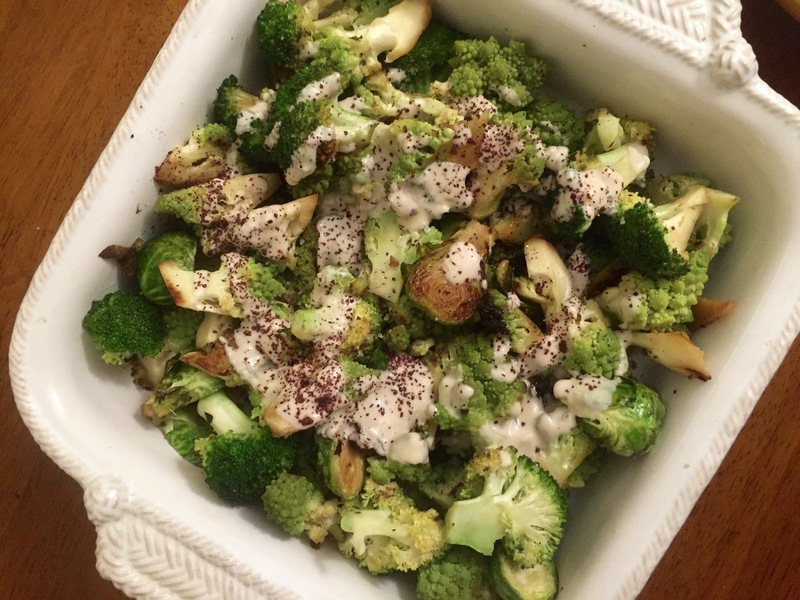 The contact of the broth with the hot pan's bottom immediately creates a steam bath for the romanesco, ensuring that the crunchy florets lose their raw bite in the final minutes before serving. Genius, right? To my delight, the pan-charring worked for two other winter vegetables I generally reserve for time-consuming oven roasting as well, broccoli and brussels sprouts. This recipe hails from the Gjelina cookbook by Travis Lett, a connoisseur of phenomenal vegetable preparations. 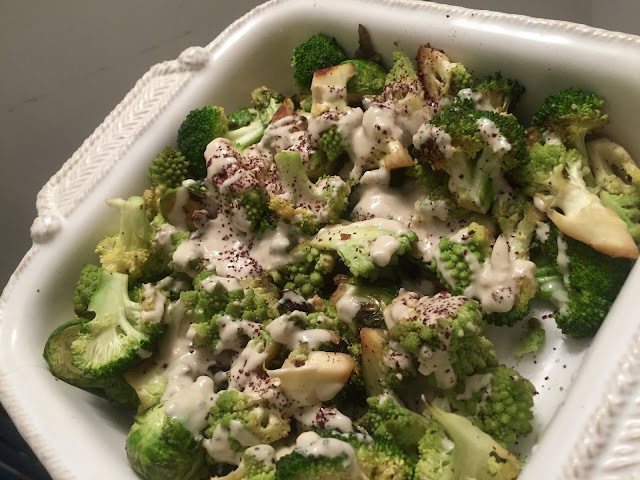 Everything is nuanced: the sweetness of the raisins and nuttiness of the tahini amplifying the flavor profile inherent to the romanesco, the sprinkle of tangy Sumac and coarse sea salt to finish. The presentation is beautiful, a masterpiece fit for entertaining that feels almost indulgent when whipped together on a random weeknight for one. Substitutions are effortless and welcome: romanesco can be subbed out for any other hearty winter vegetable, golden raisins with many a dried fruit. If Sumac isn't a pantry item for you, top with finely grated lemon peel instead. 1. 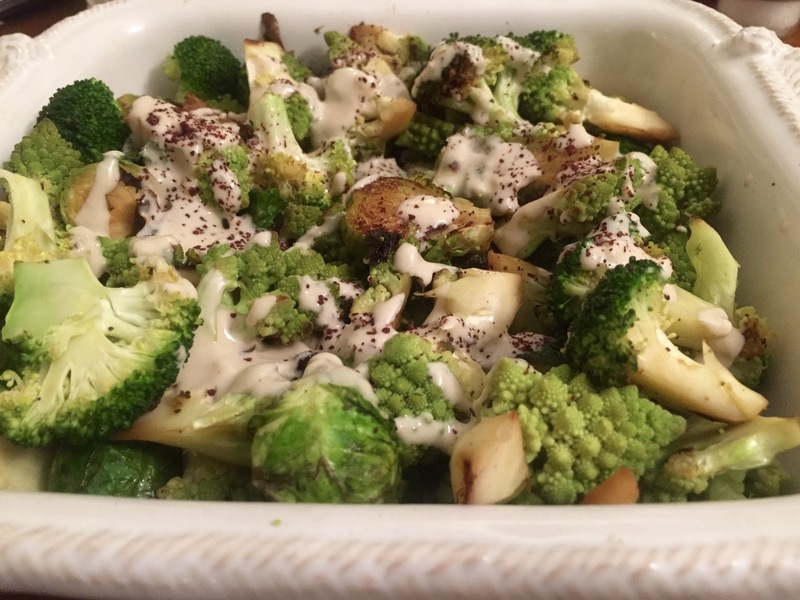 In a small bowl, combine the tahini with the lemon juice, garlic, and cold water. Whisk in the extra-virgin olive oil. The sauce should be thin enough to drizzle with a spoon. (If it is too thick, add in more cold water, 1 Tbsp at a time.) Season with kosher salt and pepper. 2. Heat a large frying pan over high heat. Add enough extra-virgin olive oil to coat the bottom of the pan, and warm until hot but not smoking. Add the romanesco, cut-side down, and cook until deep golden brown in color, 3 to 4 minutes. Stir with tongs or a wooden spoon and cook for 2 to 3 minutes longer. Turn the heat to medium and add the raisins. Season with kosher salt and cook, stirring, until the raisins soften, 1 to 2 minutes. Add the stock and allow the ingredients to steam briefly. Taste a piece of romanesco for seasoning and doneness; it should be tender. 3. Transfer to a serving platter, drizzle the tahini sauce on top, sprinkle with sumac, and garnish with sea salt and a drizzle of best-quality olive oil. Serve warm or at room temperature.